The record's title song became the group's second #1 single on the Billboard Hot 100, in July of that year. The album released three Top 10 singles, "One Of These Nights", "Lyin' Eyes", and "Take It To The Limit". Those singles reached #1, #2, and #4 respectively. The album became the band's first album to top the charts. The album sold 4 million copies and won the band its first Grammy for "Lyin' Eyes". "Take It To The Limit" became the band's first gold single and the album was nominated for album of the year. The album also features the live concert staple and ballad "After The Thrill Is Gone". 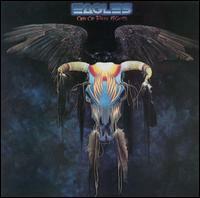 One of These Nights is the last Eagles album to feature Bernie Leadon. Leadon would leave the band after the One Of These Nights Tour. The seventh track, "Visions", is the only Eagles song on which Don Felder sang lead vocals. The album would become the band's breakthrough album, transforming them to international superstars and establishing them as America's number one band. The band would go on a worldwide tour to promote the album; Fleetwood Mac opened for the band during the tour.